The above illustrates the premium rate paid by the utility company for each unit of energy produced by your home Solar PV. This is the case for solar photovoltaic; there are three other renewable energy sources that enjoy the feed-in tariff (FiT) under the newly passed Renewal Energy Act, namely small hydro, biomass and biogas. For a complete guideline of the different rate, refer to the Feed-in Tariff Update by KeTTHA. With this attractive FiT rate, the government hopes to solve the slow implementation and take up of renewable energy generation in the country. Remember how many signed up for the Suria 1000 incentive that the government mooted not too long ago? Only a handful. 1. 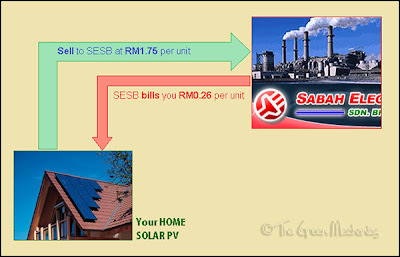 Feed-in tariff rates need to be high enough to produce ROI. Put in some carrot in the form of profit to woo takers. Where there is opportunity/profit there is risk worth taken. 2. "High enough" is not attractive if it is not coupled with a "long enough" period to make business sense. The RE Act provide for 21 years. I think that's long enough for any business venture. 3. Ready buyers. 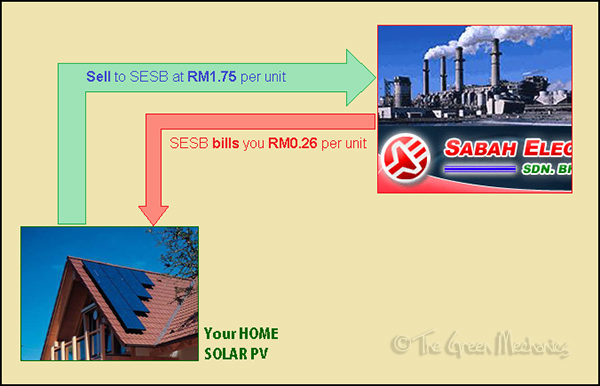 No worries there; TNB, SESB and SESCO are obliged to purchase all electricity generated. 4. Fund to finance FiT cost. I think it is the responsibility of everyone to make RE energy a success, and what a better way to take part than to contribute through your utility bills. Yes, we are expected to pay higher electricity tariff in a near future - maybe not all of us - and the extra money we pay to the utility companies can be used to finance the FiT cost. 5. Clear procedure on local approval. Not like the process you have to go through land applications in Sabah. 6. Transparency in implementation such as involvement of only competent persons, constant monitoring, periodical reporting of progress, etc. We do not want to see sudden mushrooming of Jacks and Joe's who know little about things but get the upper hands on what to implement. 7. Calculated degression. Degression means gradual decrease in the FiT rates until they come to parity with the prevailing electricity tariff. This way people are forced to improve such technology to lower the manufacturing cost. For solar PV, degression rate is 8%, a bit steep in my opinion but let's take this as a challenge and beat that figure with even cheaper solar panels! 8. There is an old Malay saying "Ukur baju di badan sendiri". We know the RE Act was adopted from what has been in practice by several Western countries. What we need is to carefully customise it to Malaysian context. A u-turn of decision after a couple of years down the line would not look impressive to say the least. Let's hope the premium FiT rates spurs us on to achieve the country's goal to lower carbon emission, starting this 3rd Q of 2011. Fingers crossed we do not have to go through the 'brilliant' u-turn decisions on Teaching Maths & Science in English. No, the FiT has nothing to do with that.